Bono shines like stars in the summer night in Baltimore. I’ve been a Florida girl for 93 percent of my life. But I’ve never been as hot as I was in Baltimore. The June 22 show was one day after the summer solstice, and while Bono didn’t sing the “shine like stars in the summer night” verse of With or Without You like I’d specifically requested, it was still another perfect show. Sometimes I forget U2 isn’t everyone’s universe. The hotel I booked was just four blocks from the venue. I could see the stadium from the parking lot. I could hear the diesel roar of the Upstaging red Kenworth trucks parked nearby with tons of U2 equipment waiting to be unloaded. (I could also see hypodermic needles on the road in between the two.) The next day would bring reunions with friends met in other GA lines (Tim C, Jennifer, Katie, Amp, Casey, to whom I apologize for almost getting her arrested), a whole new crop of awesome GA friends (shout-outs to Michelle, the Heathers, Syrene, Laura, my rail-mate Julie and Brad, who did an awesome job running the line) and the excitement of getting my number. But it was like trying to go to sleep on Christmas Eve. I kept waking up every few hours wondering if Bono had slid down the Claw yet. I headed up to M&T Bank Stadium around 9 a.m. and was No. 5 in the GA line — the closest to the front I’ve ever been. It’s always a little stress-inducing wondering if the GA line is going to go smoothly. There’s the possibility another line is forming on the other side of the stadium, or that event security will disband us and shoo us off the property, or that all hell will break loose as they let us into the gates and the person who was No. 400 in line somehow gets to the floor before No. 4. But this line was expertly run, from the self-policing U2 fans to the incredibly helpful security staff at M&T Bank Stadium. They let us stay on property the whole time, they checked on us, they ensured that we were let in in the exact order we lined up. Tim C’s done 27 GA lines of his 32 shows and said this was undoubtedly the best he’s ever seen the entrance handled. We saw one of the head staffers after the show and went up and hugged him. Can’t say enough good things about them. The hard work in line paid off with a spot on the front rail just three people to the left of Bono’s mic stand. The downsides are that I can’t see the screens from that close, I can’t see Larry at his drum kit, and when the boys go out on the catwalk, it’s hard to track them as I have to turn around and am then at the back of the sea of people, and I stopped growing vertically when I was 14. The upside is, I’m right under Bono’s nose for most of the show. Florence and the Machine opened the concert. I keep using the word “hypnotic” to describe Florence. I’m unfamiliar with the group’s music aside from their radio hit, Dog Days Are Over, but I was captivated the whole time — if not for the music, for the way she flits around stage barefoot and wrapped in sheer, gauzy, flowing red layers. And no pants. Just red bloomers. The U2 setlist was pretty similar to what I saw in Denver. The biggest thrill was the addition of The Fly. In fact, the band opened with four straight songs from Achtung Baby (Even Better Than the Real Thing, follwed by The Fly, Mysterious Ways and Until the End of the World), and played One and Ultraviolet later (One is a given, but they’ve been switching up Ultraviolet and Hold Me, Thrill Me, Kiss Me, Kill Me). This year marks the 20th anniversary of the release of Achtung, and there’s speculation that its infiltration of the setlist is a sort of preemptive promotion of the remastered album that will come out at the end of the year. Whatever the reason, I loved getting to hear half of my favorite album live 20 years after it came out. So, no big changes to the setlist for me. (Here’s the full Baltimore setlist.) The highlight of the night was the crowd energy. We’d been in the hot, wet heat all day (some of us for two days) and had the 93-degree sun glaring down on us outside the stadium and more once we got inside. It was a struggle between wanting to stay hydrated with as many $4.50 waters as I could drink, but knowing I’d have to brave the rest of the growing GA pit behind me to go to the little girls’ room. Despite the energy-sapping conditions, the crowd was euphoric, jumping the entire time, slowing down only when Larry’s drum beat did. And it did slow down, to a beautiful, pulsating version of Scarlet, during which Bono sings his part, and then lets the audience echo his shouts of “rejoice,” carrying it into Walk On, a song I think has had some wonderfully poignant moments (with much relevance post-9/11 and in relation to Aung San Suu Kyi), but one I wouldn’t mind seeing dropped from the setlist, and replaced with something from No Line On the Horizon — don’t know if you remember it, but it’s their most recent album. I would love to hear Stand Up Comedy or Fez-Being Born, or even see Breathe or the title track worked back in. U2 dropped the new re-mix of Magnificent from the Baltimore show — that seems like one they’ve been fumbling around; I thought the version they played on the 2009 leg was perfect. They also dropped the LED-light jackets all four wore during Zooropa in Denver, but their performance of the song was still stellar. Also, the band did a quick, quick soundcheck as they lined GA up in the gates before the show, and we went crazy when we heard Bono singing 40. We thought we would get it in the show, but it was just a tease. 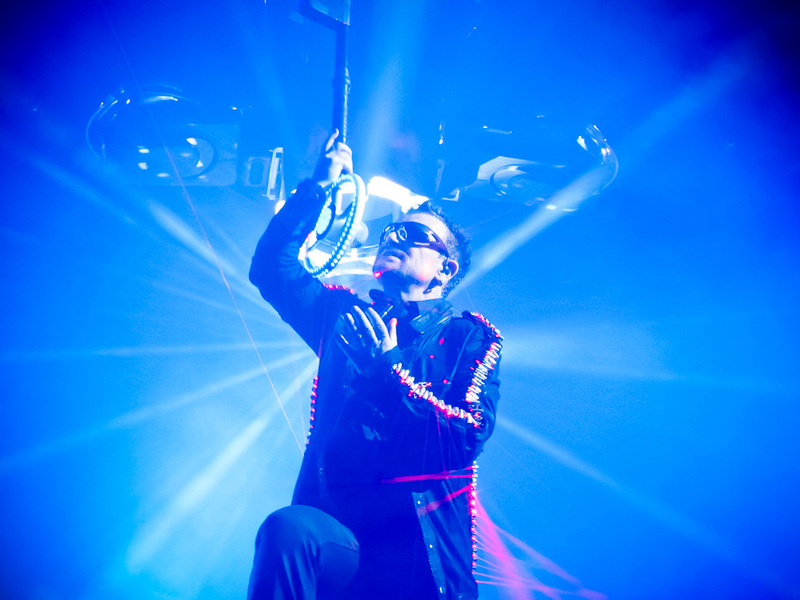 Bono was as hot and sweaty and dehydrated as the rest of us. He drank several bottles of water throughout the night, sometimes swallowing it, sometimes spitting it up into the air, but best of all, sometimes splashing it down onto the pit, “baptizing” us as we raised our hands up in celebration of him. It’s a toss-up as to what I was more excited about — having Bono water thrown on me, or having any water at all thrown on me. 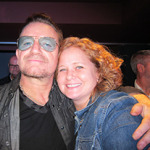 And I remember being at Denver and pausing my shivering only while U2 played, but seeing a glistening Bono up on stage. If I was soaked with sweat at the Baltimore show, he had to be suffering, despite trading out his usual black leather garb for black denim. While the sun was shining down on us the whole time, the Baltimore Sun was, too. The GA crowd and the concert in general stirred up quite a media frenzy. A blogger from the paper interviewed us when we were just a line of four on Tuesday morning. I threw my blog address out there and was amused to see it made it into the article. Steve Kilar from the Sun interviewed our group of six in the GA line early Wednesday morning. There are some pretty impressive stats within the group, and he especially took to Tim C’s and Jennifer’s stories for this nice write-up of the GA experience, and a quote Tim C will never live down. The Sun included a nice photo album the next day of the pre-show activities and the show itself. Our GA group (and my numbered fist) make a few appearances. So, another great show. Up next: East Lansing tomorrow night!